Jodanga is a Backpackers Hostel completely run by young people like you! We are a true Traveler’s Hostel. NOT THE CHEAPEST, but definitely the best in Santa Cruz. 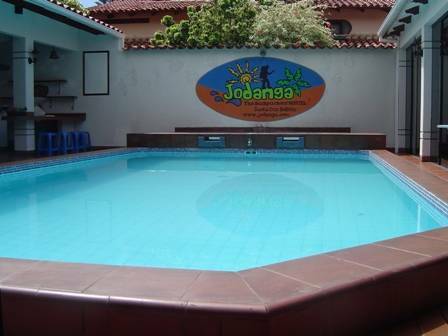 Jodanga is a Backpackers Hostel completely run by young people like you! We are a true Traveler’s Hostel. NOT THE CHEAPEST, but definitely the best in Santa Cruz. If you don’t want to stay in a dingy old saggy mattress residential or alojamiento without life, Jodanga is the place for you. Come visit our backpacker luxury! 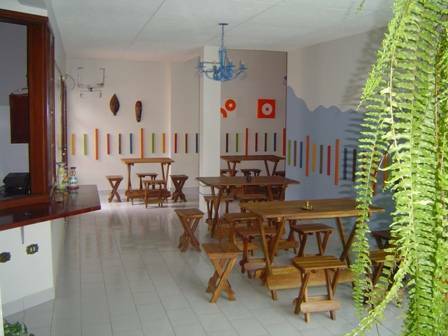 Fully refurbished and with more than 6 years of experience hosting happy travelers. We offer you many services to make your stay in Santa Cruz the most comfortable possible and to give you access to all the tourist information you need to travel around Bolivia. SWIMMING POOL, Pool Table, Football Table, TV room with the last films in DVDs, sitting rooms and "all you can eat and drink" BARBACUES that we organize every other day, make the perfect frame to make many friends and have a great time. Buffet breakfast with delicious fruit, natural juices and a person that cooks fresh eggs the best way you like them in front of you and at the precise minute you want them. Fancy nice scramble eggs? Everything is extra clean! Spacious dormitories with air conditioning and private bathroom, comfortable beds, 24 hours hot water, self-catering kitchen, computers with Internet and WiFi, BOOK EXCHANGE, laundry service, SPANISH AND ENGLISH LESSONS and lots of tourist information. Bilingual and very friendly staff willing to help you 24 hours with everything you may need. Strategic location between the BUS STATION (18 minutes walk - 5 min by taxi), LOCAL AIRPORT “El Trompillo” (15 minutes walk - 5 min by taxi) and CITY CENTER MAIN PLAZA (about 25 minutes walk -10 min by taxi for less than 2 USD). Only one block from the largest and most important Park in the City. Close to the hostel you will find restaurants, fast food venues, street vendors, supermarkets, market, banks, ATMs, pharmacies, cinema and everything you need. This hostel is about relaxation, meeting other travelers, experiencing the tropical beauty of Santa Cruz and its hectic nightlife.. Jodanga is the best starting point for exploring all that the city and surrounds has to offer so come, feel at home and have an awesome time with us! If you plan to arrive LATE IN THE NIGHT (after midnight and before 6. 30am) remember to BOOK FOR THE NIGHT BEFORE, our check in time is at 2. 00pm. Ex. Arrival 17/6 at 3am, you must book for the 16/6. NO CHECK-IN BEFORE 2PM (we need to clean the rooms first!) You may leave your stuff in the storage room though and use our communal areas or come back later. PAYMENT IS DUE AT ARRIVAL. We accept cash, Visa and MasterCard. Valid PASSPORT ID REQUIRED ON CHECK-IN. FAMILIES TRAVELLING with children under the age of 16 are required to BOOK PRIVATE ROOMS. CHILDREN under the age of 16 are UNABLE to be accommodated IN SHARED DORMITORIES. If you need to CHECK OUT LATE IN THE NIGHT (after midnight and before 6. 30am) you need to INFORM RECEPTION IN ADVANCE (before 10:30PM) so we can arrange check out and to refund the deposit. Hostel Management reserves the right to cancel or amend a booking for anti-social behavior towards hostel staff and/or guests, or non-adherence to our terms and conditions. Please inform us about CHANGES in your BOOKING or about CANCELLATIONS at least 48 HOURS BEFORE ARRIVAL via email (free of charges). After this date, charges to your Credit Card will be applied up to the FULL COST OF THE RESERVATION. Cancellations or changes made by phone can not be accepted. We will verify and preauthorize the full amount to your CREDIT CARD, but we do not charge it! If the card DOESN`T WORK, the BOOKING is NOT VALID. Instructions: Ask to the taxi driver “Me lleva a la calle El Fuerte #1380, “Barrio los Choferes” (UV 6, Zona Parque Urbano). The hostel provides AIRPORT PICK UP SERVICE FOR 120BS, if you choose to reserve this service please send us your flight details and complete name up to 48 hrs before your arrival date. We will contact you as soon as possible to confirm the service. Time: 25 – 45 min aprox depends of the traffic. Tips: Outside of the terminal there are “white and blue” colored taxis (official taxis from Viru Viru). Ask them to take you to Jodanga Hostel, they all know how to get there. Time: 50 – 90 min aprox depends of the traffic. Price: Between 5 and 10Bs. Instructions: Direct outside of the airport micros (a type of mini bus) leave every 20 minutes to the national airport El Trompillo, wich is close to the hostel. From there you can take a taxi to the hostel or you can walk it in 18 minutes (for the easy route, see beneath). TIPS: Do not take a taxi from outside the “El Trompillo” airpot, they will charge arround 35Bs. Just walk strait out of the airport till the main road (this is the Segundo Anillo Avenue) and take a taxi from there, you should pay between 10 and 15 Bs. Time: 5 min aprox depends of the trafic. Instructions: Walk strait out of the airport till the main road (this is the second anillo). Turn right and go straight ahead over the round about named 'Madre India', keep walking straight ahead (so follow the Segundo Anillo Avenue). Turn left after two blocks from the round about into calle Peña (be careful when you cross the Segundo Anillo Avenue). Walk straight ahead through the small park, keep the basketball place on your left hand side and go through the short small unpaved path. Walk one hundred meter further straight ahead until the very tall building and turn than to the right into Calle El Fuerte. After 50 meter you will see our hostel at your right hand side number 1380. Nearest airport: El Trompillo Airport 1 km. Viru Viru Airport 16 Km.